Where does your Self Storage Company Rank for the terms your customer use to find you on the Internet? Type in your “City” and “State” to see the results. Where Does Your Self Storage Company Rank? Create a favorable impression through your business listing on the Internet. Monitor and maintain your reputation. Use your reputation to generate trust and sell storage space. You can do all of these things with a simple business listing on the Internet. Once you’ve optimized and publicized your business listing, it gets more powerful and more persuasive with every passing day. So, unlike the Yellow Pages where your listing is only good for one year, your listing on the Internet is good forever … and it doesn’t cost a penny to maintain. What Do I Do Now! If your self storage company is not showing up for the most commonly used terms people use to find your business, you can do one of four things. It took us a long time and a lot of experience to learn how to do local search marketing right and avoid the potentially damaging potholes. Because of that, we tried to add as much information as possible to our site to help you get started in the right direction. There are local search marketing specialists who can do this for you. Prices range from as little as $300 for claiming your business on Google to $1,000 for the whole nine yards. Be very, very careful who you hire however because you’re going to have give them your usernames and passwords. If the process seems too difficult or risky, we can help. In order to get the very most out of your local search marketing effort, you must do more than just optimize and publicize your business listing. We can teach you and/or your staff how to use your business listing to generate even more business. We can teach your members how to use your business listing to generate even more business. Hint: It has to do with great customer service and generating five star reviews. 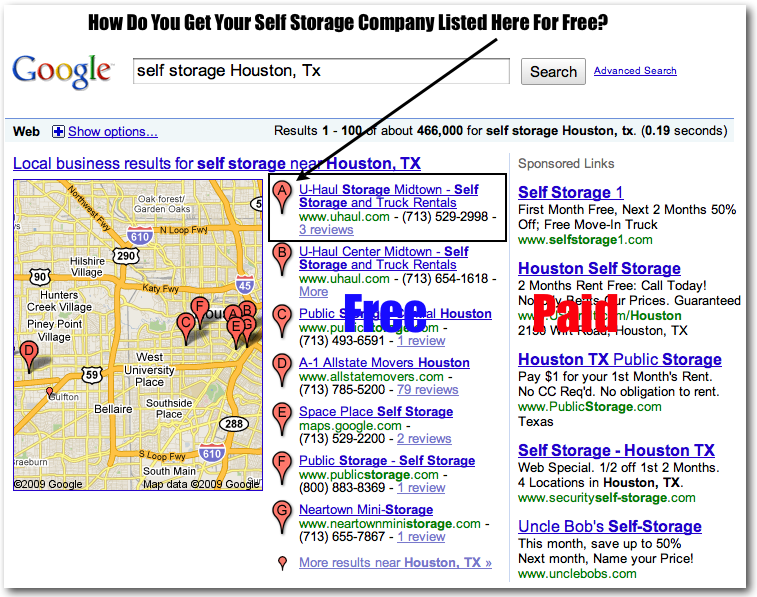 Consider our Self Storage Local Search Marketing Workshop.